If you decide to become a professional floor installer, apart from the installation, you need to learn how to do a hardwood floor repair. Repair is an integral part of your future job and will provide you with extra money. So let’s look at some of the techniques you can use while doing this job. Hardwood floor repair is done only in two ways. Either you will be refinishing the entire floor or changing only a few pieces of material. For information on how to refinish a floor, you can read in other articles on this website, but now let’s talk about replacing pieces of wood during the repair. How is it done? To remove a board, or even part of the floor, you will need skilsaw. Make a diagonal and longitudinal section (cut) of the entire depth of the damaged piece of wood (up to the subfloor), then remove the small cut pieces with a chisel and a hammer. This should be done very carefully to prevent damaging the adjacent boards. What width and length should be cut? A section’s width should be 2 inches with a length of 4-5 inches. The smaller you cut them, the easier it will be to remove. Before you make cuts, do not forget to apply masking tape around those boards that need to be removed. This is done in order to avoid damage to the adjacent piece of wood. If you need to replace some damaged boards – stick tape on their perimeter. Once you have removed the board (or a few boards), you need to thoroughly clean the place with a vacuum cleaner. 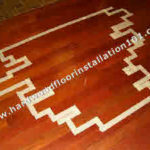 The next phase of your hardwood floor repair – it is preparing a new board instead of old one. It must match the exact size of the remote piece. This should be done with the help of the tablesaw and mitersaw. Apply glue to subfloor and on the back of the board. For the strength grease end of the new board flooring glue “Tong End Groove” and insert. If necessary (if it is unfinished floor) you can use top nails. When installation is complete, put some heavy stuff on a piece of hardwood, which you just installed to hold him tight to subfloor. Since hardwood comes in two types – solid wood and engineered, is there a difference in how to delete these different quality board? The difference, of course there is! If you need to remove a piece of solid wood use only skilsaw. The engineered hardwood can be easily removed with a hammer and chisel – layer by layer. When you need to repair the floor? Hardwood floor repair is done when there is the mechanical damage. Let’s say customers drop something or after a hard pressed something heavy on the floor, and this has remained a deep ugly dent. Very often hardwood repair is due water damage. For example, they keep a flower on the floor, pouring it and did not notice hardwood’s water damage under pot. Many customers find that the wooden floor in the kitchen area – it is fashionable, and ask to install hardwood at the same level in the kitchen, dining area and in the other rooms. For this reason, at the slightest water licking flooding occurs in every room. 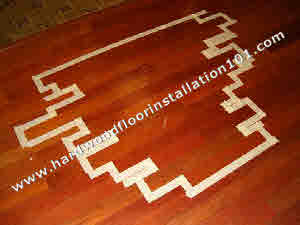 In this case, hardwood floor repair is not necessary, as it will be necessary to change the entire floor. No matter what the material is in the kitchen – hardwood, tile, linoleum, etc., principally, that the floor level in this area should be lower than the floor level of the other rooms. You can also cut kitchen with transitions, which in the case of water damage can hold water for a while. Most of the hardwood floor repairs must be made immediately after installation, especially when deliver the heavy appliances into kitchen. You should always choose a moving company that uses special tools to carry heavy furniture, appliances and makes it very carefully. For more information on hardwood floor repair, watch our videos and read other articles and posts.